The Culture of "Did you eat? " 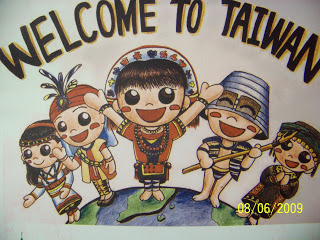 in "The Taiwan"
NOTHING will KILL a conversation in an ESL classroom in Taiwan like the words “How are you? This is quite the difference from let’s say asking a 13 year old American ‘”valley girl” the same question. I would imagine some 7th grade teachers probably avoid this question like the plague in fear of hearing about some girl’s shopping trip for an entire period of Chemistry class. For my approximately 211 days of residency here in “The Taiwan,” I was desperately trying to find out why nobdoy would give you an honest response to this question. Coming from a middle-class family in America who never once had to worry about food this was quite the suprise to hear. There also seems to be no shortage of food here either. Apparently, this dates back to thousands of years ago when food wasn’t always an assumed reward or gift for a day’s work. I was also told that this is the ultimate way of showing that you care about the person. One more reason for a very dry and monotone answer to this question exists.Reason #2 stems from the idea of always being humble. This works for if they are having a bad day or a good day. They don’t want to ruin your moment if they are having a bad day, and they certainly don’t want to rub it in your face if times are tough for you. This entry was posted in Did you eat today?, How are you?, Humble Taiwanese, I'm fine. Hey. Taught for 10+ years in the 'Wan and I'd like to encourage your blogging – let it allll out, big guy. Personally, I'm charmed a bit and your blog brings back some nostalgia for me from '99 when I was first starting. Ahhh, I'm Lau Gau. (Old Monkey) Anyway… If I may – your logic is a bit off when you compare "How are you?" to "Have you eaten?" here's why: "Ni how ma?" directly translates to "You ok ?" so they understand the concept perfectly but the answer "I'm fine thank you, and you?" makes more sense to them plus by now hopefully you've figured out that in the 50's the govt legislated the way English was to be taught: rote. So all your students try to dutifully memorize answers (as it's done in their language) so they can get "the good grades." Think of it like this: an entire country tries to learn English by memorizing the dialogue of a play, or more correctly the dialogues their government has sanctioned as being "correct" to be marked thusly and necessarily graded for their traditional Confucian examination system. Best advice I ever got from an veteran teacher was this: everybody needs at least six months to adjust personally to Taiwan, it's a special place. It is, but you've realized that by now. It takes longer if you are off on your own trying to bash through your functional illiteracy, your alienating loneliness, and constant belligerent frustration with and from the Taiwanese. But, it gets better. PS. second best advice? For men, the easiest way to learn the language is in bed… hahahahaha. Carpe diem. Thanks so much Jason for the insight! I never realized that "are you ok? " is the direct translation. It definitely makes a little more sense to me.I always welcome any advice from "The Taiwan" veterans. I just try to be as open-minded as possible while learning more and more about this special place. Some days are better than others for sure.It was also really nice to hear that it gives you a little bit of nostalgia.P.S.- I also know "the language exchange" ha!